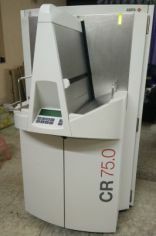 AGFA CR 75 Digitizer with 2 workstation, one NX workstation for general radiography other QS workstation with Mammography. DOM 2006, installed in 2008 and always in AGFA Service contract, good working and cosmetic condition. Total 8 cassettes of bellow size. MM 3.0 10x12 02 nos mammography cassette.